Let’s face it, training for a 10-mile race in February isn’t everybody’s idea of a good time. And until a few years ago, it was about the last thing that Carmie Heisler ever imagined doing herself. After all, the 44-year-old computer programmer and mother of two ran her first 5-K in 2011. What’s more, she has a condition called cold urticaria - where she develops hives in certain wintry conditions. But in the course of completing last year’s Thanksgiving to New Year’s running streak sponsored by Fleet Feet Maine Running, she was able to to learn how to gear up enough to tolerate more cold-weather running. She signed up for the free Winter Warrior program, and now she’s training for the Mid-Winter classic on February 1. Family: My husband Rick and I have two kids: Elsa (14), and Magnus (11), and one extremely fluffy cat named Bruno. Go-to piece of gear: I love my Garmin! What prompted you to start running? A few years ago, my dad started walking in the Back Cove, he lost so much weight and made such improvements in his health that people didn’t recognize him. I joined him at least once a week. Mostly, I was inspired by his diligence and the result his walking was having on his overall health. What’s the most rewarding part of your running life? My running family. I am so lucky to spend time with people who amaze me and who challenge themselves and make their dreams come true. It's wonderful to witness. And everyone is so supportive of one and other. It's awesome. When winter came, I moved my walks indoors to a treadmill. That was really boring! I had heard about the Couch-to-5K program. I started following it on the treadmill simply to fight boredom and to potentially burn more calories in less time. 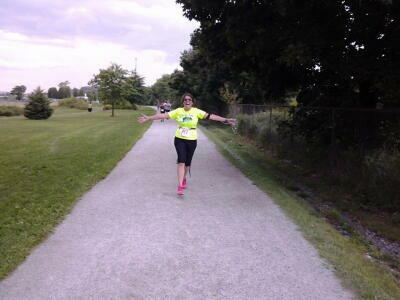 By the end of the program, I was hooked on running and signed up for my first 5K in April 2011. What prompted you to start running? I have cold urticaria, which means that I have an allergic reaction to cold conditions. I get hives. Maine Running had a program in 2013 to support a running streak between Thanksgiving and New Year's. I completed that program, and because there were days when my gym was closed, it gave me an opportunity to experiment with how to run outside without getting an allergic reaction. I heard about the Winter Warriors, and decided to sign up because it was free, I had nothing to lose, and if I did well, it would be a fun and ironic title to hold. I attended 29 out of the 32 runs. The only ones I missed were because I was out of town. Now I’m training for the Midwinter Classic on Feb 1. I never would have considered running 10 miles outside in February before Winter Warriors! The training has been so much fun. What was your most memorable racing experience? My first half marathon: the 2013 Race the Runways Half-Marathon at the former Naval Air Station in Brunswick. It was special because each long run during training represented a milestone distance. Also, I trained on a treadmill for every run except one 14-miler. It was so cold and windy on race day; there were gusts of up to 50 miles per hour. My family dropped me at the starting line (they didn’t want to get out of the car). When they saw how windy it was they all screamed "Don't do it - Come back in the car!" It was a pretty flat course but the conditions were so tough; some of the course is on the runway, and we had to run right into the wind. I am very proud of that race. What advice would you give to a beginner or someone who is just starting out? Slow down and have fun and smile. And get fitted for the correct shoes. (This is something I learned the hard way). Want to share the story of your running life? Write to us!